The Trans-Siberian express is the longest uninterrupted train route in the world - crossing 6 time zones and a multitude of different terrain ranging from forest to mountain to desert to steppe. The Trans-Siberian Railroad stretches almost 6,000 miles from Moscow to Vladivostok. It is an adventurous journey through Poland, Belarus, Russia, and Mongolia. Depending on the route you choose, you can visit cities like Minsk, Saint Petersburg, Moscow, Novosibirsk, Irkutsk, Ulan Bator, and Beijing. If you wish to take the Trans-Siberian railway from Beijing to Europe, you must obtain visas for Mongolia, Russia and other countries en route. Plan ahead. The Mongolian Consulate in Beijing is only open a few hours per week. 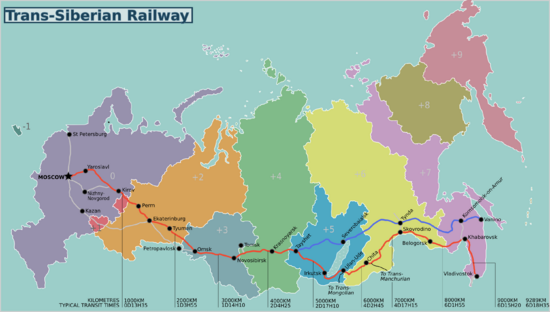 The Trans-Siberian express is divided into four route, The first, and most common, route begins in Moscow and ends in Vladivostok. This route passes through Yaroslavl on the Volga, Exaterinburg in the Urals, Irkutsk near Lake Baikal's southern extremity, and then Khabarovsk. From Vladivostok you can continue by ferry to Niigata on the west coast of Japan. A second route is the Trans-Manchurian line. This route follows the Trans-Siberian line until Tarskaya. From Tarskaya the Trans-Manchurian heads southeast into China and makes its way down to Beijing. A third route is the Trans-Mongolian line. 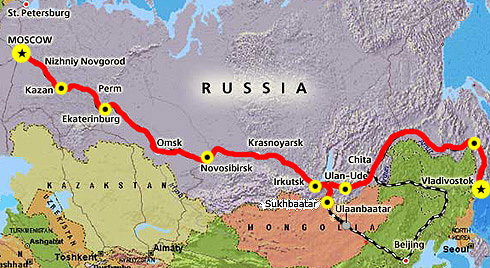 This route follows the Trans-Siberian as far as Ulan Ude. From Ulan-Ude the Trans- Mongolian heads south to Ulaan-Baatar before making its way southeast to Beijing. A fourth route is the Baikal Amur Mainline. This route departs from the Trans-Siberian line several hundred miles west of Lake Baikal and passes the lake at its northernmost extremity. It reaches the Pacific to the northeast of Khabarovsk, at Imperatorskaya Gavan. While this route provides access to Baikal's stunning northern coast, it also passes through some pretty forbidding terrain.